The Roanoke Marshes lighthouse is often one of the most overlooked of the Outer Banks lighthouses, simply because of its small stature, limited visibility and remote location tucked away at the quiet east end of the Manteo waterfront. That said, visitors to historic Downtown Manteo will have no problem spotting the small lighthouse that jets out 40 yards into the Roanoke Sound. The prim white exterior with black shutters and red shingled roof, capped off by a 2' ft., 4" in. tall lens, gives this lighthouse a classic coastal look, and vacationers of all seasons are welcome to stroll the wooden boardwalk and explore the exterior, while enjoying a fantastic waterfront view to boot. The Bodie Island Lighthouse, (pronounced "Body") is located just south of the town of Nags Head and Whalebone Junction, where Highway 158, Highway 64, and NC Highway 12 intersect. Visitors travelling towards Hatteras Island can't help but notice the black and white horizontal striped structure, peaking out over a line of dense cedar trees on the soundside. Recent visitors may have a hard time recognizing the historic lighthouse, as the top and sides are cased in metal beams. An extensive restoration project is underway, sponsored by the National Park Service, to ensure that future generations will not only be able to visit the Bodie Island Lighthouse, but also someday climb the 214 steps to the top. In between repairs, the 156' ft. lighthouse still shines a beam 19 miles offshore, making full rotations at 27.5 seconds. The current Roanoke Marshes Lighthouse, unlike its Outer Banks counterparts, it not an original. Instead, it is a replica of the original lighthouse that was constructed in 1877 at the southern entrance of the Croatan Sound in Wanchese, to help both passing sailors and local fishermen find their way to port. This lighthouse was actually the third to carry the name "Roanoke Marshes Light" as the first two, also constructed in the 1800s, were lost soon after they were constructed and put into service. The first Roanoke Marshes Lighthouse went into service in 1831 but was abandoned by its light keeper after just 8 years because of extensive and neglected repairs. The second Roanoke Marshes Lighthouse was first lit in 1858, and despite being taken out of service by the Confederate soldiers briefly during the Civil War, remained in operation for almost 15 years. Unfortunately, by 1872, a combination of sinking marshes, erosion, and shipworms had devastated the foundation structure beyond repair. A third lighthouse was build and completed in 1877, and this one was a white, square structure which was supported by seven screw piles. After a few years of trial and error, and several ships accidently banging along the base of the lighthouse, 80 more piles were installed around the base of the lighthouse, and as a result, it remained in its Wanchese location for over 60 years. By the 1950s, however, with the onset of more modern navigational tools, the Roanoke Marshes Lighthouse was simply no longer needed and it was decommissioned in 1955 and sold to a private owner. Unfortunately, this original lighthouse was lost in the sound during an attempt to move it to inland private property, and for many decades thereafter, was all but forgotten. It wasn't until 1999 when the Roanoke Marshes Lighthouse came to the attention of Roanoke Island residents again, during the planning of Manteo's centennial celebration. The town of Manteo hoped to have a full-scale exact replica up and running by the following year, however government and funding delays, as well as the unexpected onslaught of Hurricane Isabel in 2003, postponed progress. The new "Roanoke Marshes Lighthouse" was finally completed and dedicated in September 25, 2004 along with the neighboring George Washington Creef Boathouse. The fourth-order Fresnel lens in the lantern room was loaned to the town of Manteo by the US Coast Guard to celebrate the occasion, and dates back to the 1800s. Today, many Manteo visitors and even residents tend to forget that the lighthouse in their back yard is less than a decade old. Thanks to master craftsmanship and original fixtures, the Roanoke Marshes Lighthouse happily lives on, and in almost-original condition. The Roanoke Marshes Lighthouse is managed by the North Carolina Maritime Museum, which offers seasonal educational programs and activities for visitors of all ages. Open in the spring, summer and early fall, (generally from Tuesday to Saturday, 9:00a.m. - 5:00 p.m.), the interior of the lighthouse is home to local Manteo exhibits focusing on Roanoke Island's long and stormy maritime history. Regardless of whether the interior of the lighthouse is open, visitors throughout the year are still welcome to walk down the long boardwalk over the Roanoke Sound to enjoy the perimeter decks, complete with benches for taking a load off and enjoying a fantastic soundfront view. If you go, don't forget to bring your camera. This lighthouse's location jetted out into the water on the outskirts of the busy waterfront provides some exceptional photo ops of downtown Manteo and the waterfront sunsets. For the best access to the lighthouse, head to the eastern end of Downtown Manteo to the free public parking area abutting the bulk headed docks. From there, it's a hop, skip and a jump to the Outer Banks' newest, and most distinctive, coastal lighthouse. Where is the Roanoke Marshes Lighthouse? The Roanoke Marshes Lighthouse is located on the eastern edge of Downtown Manteo on Roanoke Island, and juts out roughly 40 yards into the Roanoke Sound. How do you get to the Roanoke Marshes Lighthouse? 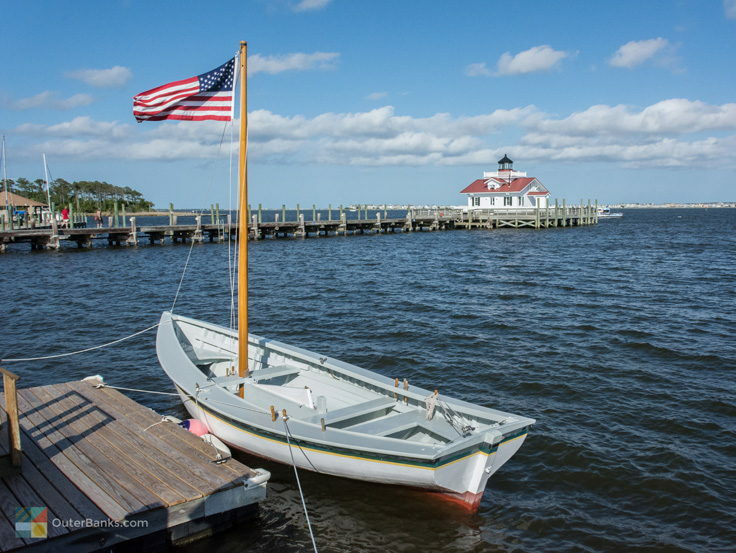 The easiest way to visit the Roanoke Marshes Lighthouse is to park in Downtown Manteo and walk along the waterfront. The lighthouse will be easy to spot, and is located next to the Roanoke Island Maritime Museum. Why is the Roanoke Marshes Lighthouse important? The Roanoke Marshes Lighthouse is distinctive on the Outer Banks, as it is the only river lighthouse in Dare County. River lighthouses are much shorter and squatter than their coastal counterparts, and they were used to guard the entrances to inland rivers and harbors. How old is the Roanoke Marshes Lighthouse? The replica Roanoke Marshes Lighthouse that is currently standing was built in 2004. The original that it represents was built in 1877, and was decommissioned in 1955. How tall is the Roanoke Marshes Lighthouse? The Roanoke Marshes Lighthouse is a modest 37’ feet tall. Can you go inside the Roanoke Marshes Lighthouse? The Roanoke Marshes Lighthouse is open for visitors, and the interior features a series of exhibits that highlight the lighthouse and the area’s history, courtesy of the adjacent Roanoke Island Maritime Museum. Can you climb the Roanoke Marshes Lighthouse? The Roanoke Marshes Lighthouse is not suited for climbing, as the structure stands just one-story tall, with a narrow, spiral staircase that leads to the top lens. Traditionally, this spiral staircase is closed to the public for safety. Is the Roanoke Marshes Lighthouse in Manteo original? The Roanoke Marshes Lighthouse that is currently standing in Downtown Manteo is actually a replica of the original 1877 lighthouse, which was lost in the sound during an attempt to move it to private property. Where is the original Roanoke Marshes Lighthouse? The original Roanoke Marshes Lighthouse stood near present-day Wanchese, at the southern entrance of the Croatan Sound. It is now buried somewhere in the sound waters, as it was lost during an attempt to move it to a new location. When was the original Roanoke Marshes Lighthouse built? The original Roanoke Marshes Lighthouse was built in 1877, although there were several predecessors to the most recent model. These early structures include a lighthouse that was built in 1813 but was abandoned, and a lighthouse that was built in 1858 but which suffered foundation damage beyond repair. When was the current Roanoke Marshes Lighthouse built? The current Roanoke Marshes Lighthouse replica was built in 2003, and was completed by 2004. 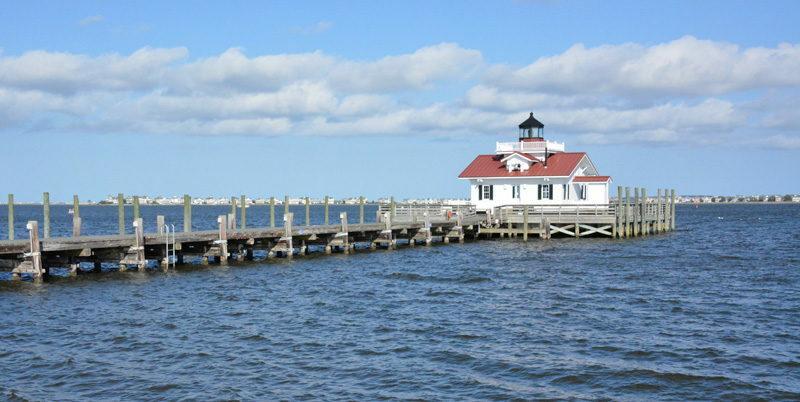 The lighthouse was dedicated by the Town of Manteo on September 25, 2004. Why is the Roanoke Marshes Lighthouse different from other Outer Banks lighthouses? River lighthouses like the Roanoke Marshes Lighthouse were used to guard inland rivers and channel entrances, while the coastal lighthouses along the Outer Banks’ barrier islands had to be seen from ships passing miles offshore. As a result, river lighthouses were much shorter and compact, as the light did not have to reach as far. Does the Roanoke Marshes Lighthouse have a light? The Roanoke Marshes Lighthouse has an original 4th order Fresnel lens. Does the light at the Roanoke Marshes Lighthouse flash or rotate? The Roanoke Marshes Lighthouse is lit at night, however, it is a fixed white light that is still used as a navigation aid for mariners heading to Shallowbag Bay. When is the Roanoke Marshes Lighthouse open? The Roanoke Marshes Lighthouse is traditionally open at the same time as the neighboring Roanoke Island Maritime Museum. In the warm weather months, the museum is usually open from Tuesday to Saturday, 9:00 a.m. - 5:00 p.m. 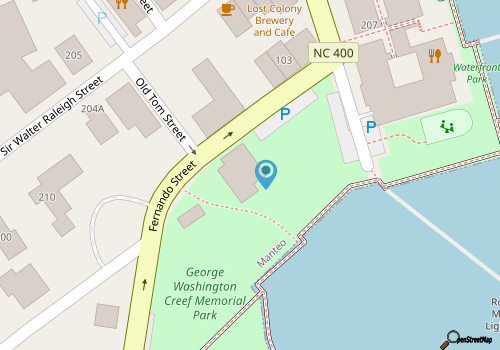 Does the Roanoke Marshes Lighthouse have a museum? The Roanoke Marshes Lighthouse operates under the management of the Roanoke Island Maritime Museum, which is located next to the lighthouse, and which features a wealth of exhibits on local coastal history. The lighthouse also has a series of artifacts within the structure itself, which can be explored and admired by visitors. Are there other river lighthouses in the Outer Banks besides Roanoke Marshes Lighthouse? Visitors can explore an original river lighthouse in the nearby Inner Banks town of Edenton. Along the downtown Edenton waterfront, visitors will find the original Roanoke River Lighthouse, which was built in 1886 and moved to Downtown Edenton in 2012. Where can you learn more about the Roanoke Marshes Lighthouse? Visitors can pop into the nearby Roanoke Island Maritime Museum for a wealth of information and history on the Roanoke Marshes Lighthouse. Many Downtown Manteo shops also feature artwork, books, and other gifts and souvenirs that feature the Roanoke Marshes Lighthouse. Call 252-475-1750 for current hours. The Ocracoke Harbor is easily the busiest quarter mile stretch of Ocracoke Island. Consisting of a small, lagoon-like section of saltwater, and lined by a semi-circle of docks, restaurants, shops, marinas and motels, visitors will find that any and all of the activities on Ocracoke Island can most certainly be found harbor front.